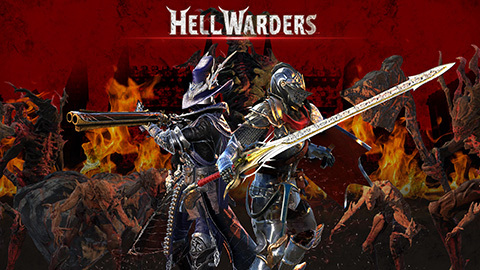 Hell Warders is a multiplayer Action Hero Defense game where players have to face Demonic armies. It is up to you and your friends to build deadly defenses or find epic weapons to fend off the invasion. For as long as mankind can remember, the Warders gave their lives fighting back the forces of darkness. An eternal war waged by mortals against a seemingly ceaseless legion. As one fell, another Warder shall fill his ranks. With every generation of Warders, new heroes and tales are born. Will your generation finally put an end to this everlasting struggle and seal the gates of Hell? Hell Warders is part of a new subgenre known as “action-defense”. You and your friends are tasked with defending the Nexus from unrelenting demon assaults. Set up archers, catapults, and mages – and carefully choose where to place them for maximum defensive cover. Action Tower Defense Mayhem – Heroes can unleash devastating abilities and deploy strategic towers in this new defense subgenre. 4 Player Co-op – Combine forces and battle the legions of evil! Hell Warders supports cooperative play with friends or other fellow Warders online. Dynamic Maps – Dodge flowing lava or fly on a giant spinning fan! Every map in Hell Warders is dynamic and opens up a ton of different strategies. Epic Enemies – From giant shield gladiator to dark wizards, there is no telling what else lies beyond the gates of hells. The Knight – Trained from birth, the knight combines brutish strength with intelligence. He is the sword and shield of the Hell Warders. He can employ different sword play techniques, such as the Strike of Wrath or the Abyssal-strike, which pulls enemies towards him. The Deadeye – An expert cannon maker who has decided to join the Hell Warders. Armed with a variety of hand cannons he can dispatch both hordes and single demons. The Soothsayer – To fight demons, she created monsters. The summoner is able to summon dark beings from the nether and place them under her command. These fearsome creatures cause terrifying damage and are capable of healing themselves.